Happy Birthday, Dr. Seuss! Join us for Storytime, games, and activities in celebration of the beloved author's birthday. Get a coupon from our Café for a grilled cheese sandwich with milk or juice for $4! When a daisy suddenly sprouts from the top of Mayzie McGrew's head, she is faced with her classmates' taunts and her parents' dismay, and a publicity agent's greed. How Mayzie learns that love is more important than fame and fortune makes an endearing morality tale for our time. Join us for the Storytime that is vintage Seuss! Activities to follow. The Cat in the Hat then exclaimed, "Dr. Seuss is 111!" Without Dr. Seuss none of us would have ever marveled at a Truffula Tree, dodged a tweetle beetle puddle battle, or even heard a Who. So to celebrate over 100 years with cats in hats and foxes in socks(es), we are throwing a Seusstastical storytime. Please don your most impressive hat and join us! Sunday, March 1, 2015 from 2:00 p.m. - 4:00 p.m.
Read Across America encourages reading. We'll be celebrating both our love of books & one of our favorite author's birthday, Dr. Seuss. We will once again have some of our favorite guest readers sharing their favorite books & reading them to us. Local author Rebecca Seymour, Police Chief David Beguhn, Fire Chief Glenn Leidel & Oconomowoc Public Library Children's Librarian Caitlin Schaffer. We'll be enjoying some Seussical silliness with a Hat toss, a Matching Game, a Tattoo station, & Thing 1 and Thing 2 photo op. We'll be making Cat in the Hat masks and delicious Seuss hats we can eat. .
Ok, young jokesters, this storytime is for you! Come join us for some super silly stories that will have you rolling on the floor laughing. We’ll read excerpts from the wonderfully ridiculous Fox in Socks along with other tales to tickle your funny bone. Don’t be late for a morning of jokes, giggles, and guffaws! GRINCHY Story Time with John Pence! On Saturday, December 20, the amazing John Pence will be guest-starring at Avid's story time. Join us for a thrilling reading of Dr. Seuss's How the Grinch Stole Christmas. We'll have snacks and complimentary hot chocolate! 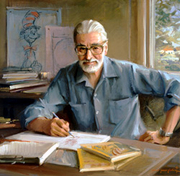 Theodor Seuss Geisel (March 2, 1904 – September 24, 1991) was an American writer, poet, and cartoonist. He was most widely known for his children's books, which he wrote and illustrated under the pseudonym Dr. Seuss. He had used the pen name Dr. Theophrastus Seuss in college and later used Theo LeSieg and Rosetta Stone. Dr. Seuss is currently considered a "single author." If one or more works are by a distinct, homonymous authors, go ahead and split the author. Dr. Seuss is composed of 103 names. You can examine and separate out names.